You are here: Home / CNC Hardware / How do CNCs Work? There are many types of CNCs (computer numeric control), but for most woodworkers a 3-axis CNC router is the right tool and also the most affordable. The axis are: X, Y and Z. The spindle or router travels along the long axis and on an overhanging gantry for the perpendicular second axis. 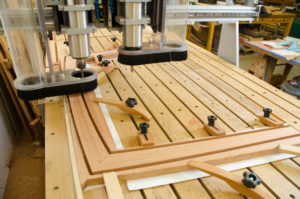 The third axis is just the up and down movement of the router or spindle takes as it travels along the other two directions. A CNC machine’s actions are digitally controlled by a computer or a controller that’s attached to the machine. Instructions for where the spindle is supposed to be and how fast it moves are sent to the CNC control box via little lines of code called G Code. That might sound a little geeky and intimidating but rest assured that you don’t have to understand G Code to run a CNC. Mostly, you just need to be able to make digital drawings in CAD, learn how to give the machine instructions via a visually interface in CAM and understand what the machine is doing. Though this is a simplified example, think of a CNC as working a bit like those older ink jet plotters that engineers and architects would use to print out large drawings. It draws lines and shapes instead of working dot-by-dot and line-by-line as a printer does. Starting with a CAD drawing of an oval, for example, the CNC positions the spinning router or spindle at one end of the oval, lowers the bit to start the cut, then and moves along the curve until the oval is complete. This is basically it – a CNC router cuts along the lines you create in your drawings. For a woodworker, that gives you a powerful tool for say, cutting out parts. Beyond that, a CNC has some potentially amazing capabilities. Think of it this way: It can route pretty much anything you can think of from the top of the bed to its maximum cutting height in all three dimensions. Now, that is a lot of possibilities.